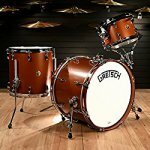 The Gretsch company makes drums for over 100 years. They started in 1883 in Brooklyn and are pioneers in creating drums from multiple ply shells, instead of a single ply. This method allowed reducing drum’s thickness and weight. 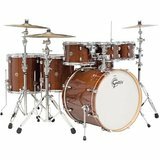 All the drums are completely hand-made by skilled and experienced drums smiths. Their drums differ from other drums in a few unique features. First of all, Gretsch drums use 30 degrees bearing edge. This creates warmer tone than 45 degrees edge from other companies. The second difference is 5-lug configuration, instead of an even number, like 6, 8, 10. It creates less tension and stress on the drum shell, so you get this distinctive tones between each of the drums. 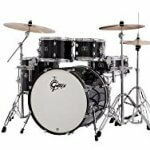 Gretsch produces a few drum series, each of which comes with multiple configurations. Below, you will find the most popular Gretsch drum sets you can buy. 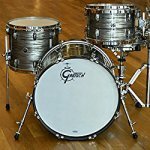 This kit is a flagship drum set, which served as a foundation for “That Great Gretsch Sound” for almost 70 years. The USA custom series uses 6 ply maple and gum shells, 30-degree bearing edges to create this balanced tone and explosive projection. GTS suspension system to optimize maximum shell resonance and tone. This drum set comes with a few dozens of different colors and patterns. Gretsch Broadkaster is created from a thin 3-ply maple / poplar / maple wood configuration. This combination of wood is what Gretsch has been using for many years. It creates this unique sound and tone. Of course, as with the other drums of this company, this one also has 30-degree bearing edges. The GTS suspension system where toms hang freely gives a great resonance and tone that is very deep and warm. If you like the vintage sound this series is for you. It comes with almost a hundred colors and patterns. 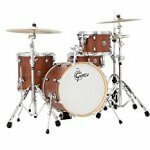 Gretsch Brooklyn is a drum kit that is named after the place where the company started. It’s a 4 to 5 piece set with an old school 1950s era vintage look and warm great tone.These drums are created from 6-ply maple wood. These drums are created from 6-ply maple wood. 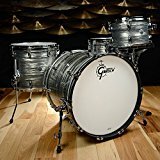 Similarly to other Gretsch drums, this one comes with the classic Gretsch 30-degree bearing edge which gives a warmer sound than Gretsch competitors. It uses Gretsch tom suspension system, called GTS. The unique 5-lug system, instead of an even number as other competitors do, gives this unique warm tone. When it comes to colors, you can choose one of a ten different satin and nitron color configurations. If you play rock and jazz, you should definitely consider this series. This drum kit comes with a few different configurations. This kit is great for younger or beginner drummers. It is a solid Gretsch product at a very reasonable price. 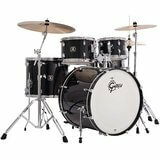 This drum set combines classical look with good sound quality. It costs about a quarter of its older brother USA Custom kit. 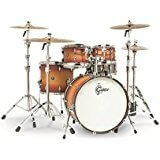 Renown features 7-ply maple shells and 30-degree bearing edge. It doesn’t come with a snare drum, so if you want one, you will have to obtain it as an add-on. It comes in 9 colors and 4 configurations. 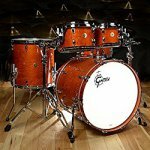 Catalina Maple is a 7-piece drum kit with this old school vibe. 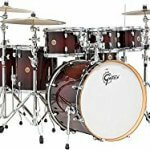 It’s created from 7-ply maple shell with a 30-degree bearing edge which gives drums a nice warm and punchy sound. 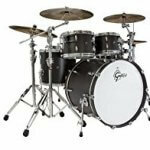 Another great feature about this drum kit is Gretch’s GTS tom suspension system. The mounting system is only attached to two of the lugs on each of the toms, so the drums are free to resonate and project their tone. It comes with this vintage round Gretsch badge, which gives it this cool old school effect. You can choose from 4 available colors (aqua sparkle, deep cherry burst, satin deep cherry burst, walnut glaze) and 3 configurations. These drums are made from 7 plies mahogany wood. It’s fun to play, giving you this warm, punchy sound. It’s especially good for jazz, but really, with this versatile drums, you can play any style of music. It is suitable for small clubs. If you are a DJ or electronic music producer, it will be also a great drum kit for you. It has 30-degree bearing edge and uses mini GTS mounting system. The snare drum is very sensitive. You can adjust it to achieve higher and lower tones. It has a nice volume bump from the edge of the drum to the center. This 5-piece drum kit is great for somebody who looks for his first drum kit. It’s really great value for the money. 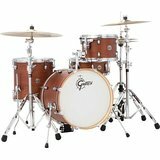 It’s made from 7-ply wood and uses classical Gretsch 30 degree bearing edges. The Energy Series uses poplar – cheap, but still great sounding wood. This move allowed keeping the price low. Energy comes with with a drum pedal, high-hat stand, and snare drum stand. It comes in one configuration.